The Color by Beseler #8912 8x10 Print Processing Drum has two permanent paper holders for 8x10 paper. However, for processing 5x7 or 4x5 prints, it is necessary to install a third paper guide in the slot at the top of the drum. 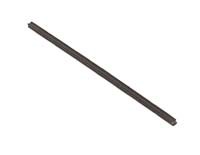 Since these rods are removable, they are often misplaced or lost. This is the correct replacement for the original removable paper holder supplied with the 8x10 drum.